If you’ve ever visited a world-class game show anywhere in the world, you are probably already well aware that corporations centered around gaming like to go BIG! …and when we say BIG, we mean really BIG…! 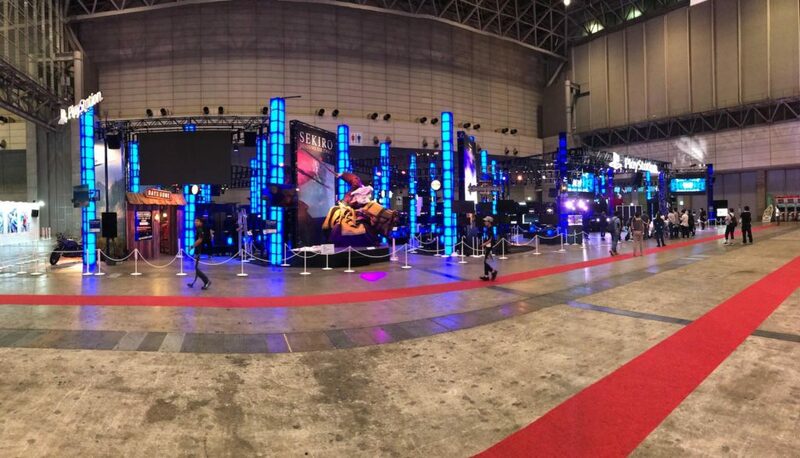 As you probably already saw from our videos on Twitter and Instagram, the booths at Tokyo Game Show 2018 were humongous(! ), and we had the chance to talk with one of the guys who makes it all happen… or at least, had a part in constructing Sony’s mega booth (shown off in the picture above). Similar to how Apple, Samsung, and pretty much every other corporation tries to prevent images of their brand new flagship devices from leaking before they are announced, booths are also on the list of “Top Secret” items which must be hidden at all costs until the big day of the show. Obviously, this isn’t the easiest trick to pull off, especially considering you are dealing with literally thousands of construction workers dashing about frantically in an attempt to get your booth up and running before the show begins. Although working in isolation from the outside world as far as videos and images are concerned is obviously difficult, (very challenging when something goes wrong), the craziest part is how fast all the booths come down! In less than 24 hours after the show ends, there is literally not a trace of Tokyo Game Show left in sight. Not only are all the booths gone (which we repeat, are humongous!) so are all the posters and billboards plastered all about the city. The only thing left after Tokyo Game Show are a few trampled flyers left on the sidewalk, the occasional cosplayer who was just a day late, and a few overstuffed backpacks filled with cool news to share with you guys!